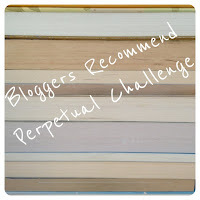 Bloggers Recommend Challenge – November 2013 – my books. my life. Can you believe it is November already? It is not one of my favorite months (I don’t like mustaches, writing 50,000 words, or turkey), but we do get some of the most beautiful weather in Florida this month. I definitely plan to be sitting out on my lanai and reading at some point this month (you know, with all that free time I have after the working and parenting is done). The November Bloggers Recommend Newsletter should have shown up in your inbox yesterday, but if it didn’t, you can view it here. I haven’t decided which one of these I most want to read yet. Maybe this is my chance to FINALLY read some Joshilyn Jackson (does November seem a little women’s fiction heavy to everyone or just me?). What are you looking forward to this month? In October, Jennifer from Bookalicious Mama reviewed the Spymistress and Becky from No More Grumpy Bookseller posted a double feature review of Just One Day and Just One Year. The reviews have been slow to come in, but I totally understand it takes awhile to get to all of these wonderful new releases. Remember, you can link up any review of a Bloggers Recommend book from any of the previous newsletters to this month’s linky. In fact, I am such a good challenge hostess that I just finished my first Bloggers Recommend Challenge book (FanGirl) last week and I never actually linked it to the challenge so I am doing it this month. If you’ve read and reviewed any and forgot to link up before, you can do so right now. It does seem very heavy on the women’s fiction this month 🙂 I’m down to do a tour with Joshilyn Jackson’s latest on my blog – it’ll be my first time reading her as well but I just read the prequel short story “My Own Miraculous” and loved it, so I expect SOMEONE ELSE’S LOVE STORY will be wonderful! My challenge pick is going to be Aimee Carter’s PAWN. Did you read Aimee Carter’s other series? I never got around to it. But this one looks interesting. No, I’ve never read her before. I have the JJ novel but see, I refuse to read her any way but with audio. So I sit and wait. And I’m totally in love with Rainbow Rowell at this point. I’m the wait list for the audio of Fangirl. I was so sad when I had to turn the a/c back on! I did it wrong :(, I read The Whole Golden World. I’ll be reading Joshilyn Jackson’s book, The Theory of Opposites, and the new Anita Shreve book. A couple of others caught my eye, so we shall see. You can put it in this months link-up. I just keep one linky open.